ARAMACC (“Annually Resolved Archives of Marine Climate Change”) is an EU-funded international collaboration whose scientific goal is to use the shells of very long-lived molluscs as a record of environmental change in the northeast Atlantic ocean over the past thousand years. The ARAMACC team is made up of scientists from Croatia, France, Germany, the Netherlands, Norway, Portugal and the UK. The research is based on the relatively recent discovery that the annual banding in the shells of some marine molluscs can be used to develop long timelines, or chronologies, of shell material using methods identical to those used in tree-ring research. 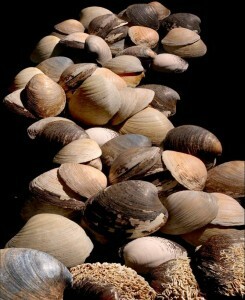 The scientific field that has developed out of this discovery is called “sclerochronology” (or “shell-ring research”). 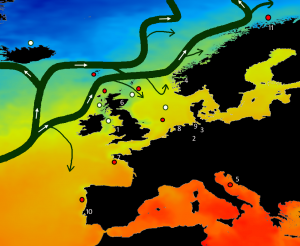 The idea behind ARAMACC science is to develop a network of these shell-based chronologies in the northeast Atlantic ocean, and at the same time to advance the applications of this kind of research in the fields of biology, climate modelling, proxy development and environmental monitoring. The Figure above shows the major pathways of Atlantic water with (red circles) the proposed sites for building new chronologies, (white circles) sites with existing chronologies, and (numbers) the locations of the ARAMACC partners. As a Marie Curie Intial Training Network, ARAMACC also focusses on training the next generation of specialist researchers. Ten PhD students are being trained by ARAMACC, each for a total of three years, and each will specialize in a specific aspect of the science of sclerochronology.